Royal Cappuccino is a user-friendly, versatile fully automatic coffee machine with built-in coffee-grinder for convenient handling and maintenance. The Royal Cappuccino grinds coffee individually for each up for superior freshness and flavour. The Saeco Royal Cappuccino is specifically designed to perform two operations simultaneously (selection key for automatic milk frothing or for steam nozzle (Pannarello). It has a container for pre ground coffee, cup warmer with slide resistant surface and removable water tank. 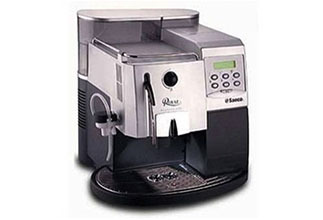 The Saeco Royal Cappuccino's brew group is where your coffee is tamped, brewed and dispensed. The patented brew group can be taken out for convenient rinsing. The brew group compartment is completely separated from the electrical compartment, fully accessible and can easily be kept hygienically clean. That is proprietary Saeco technology and one of the things that has made Saeco world leader in superautomatic coffee machines.